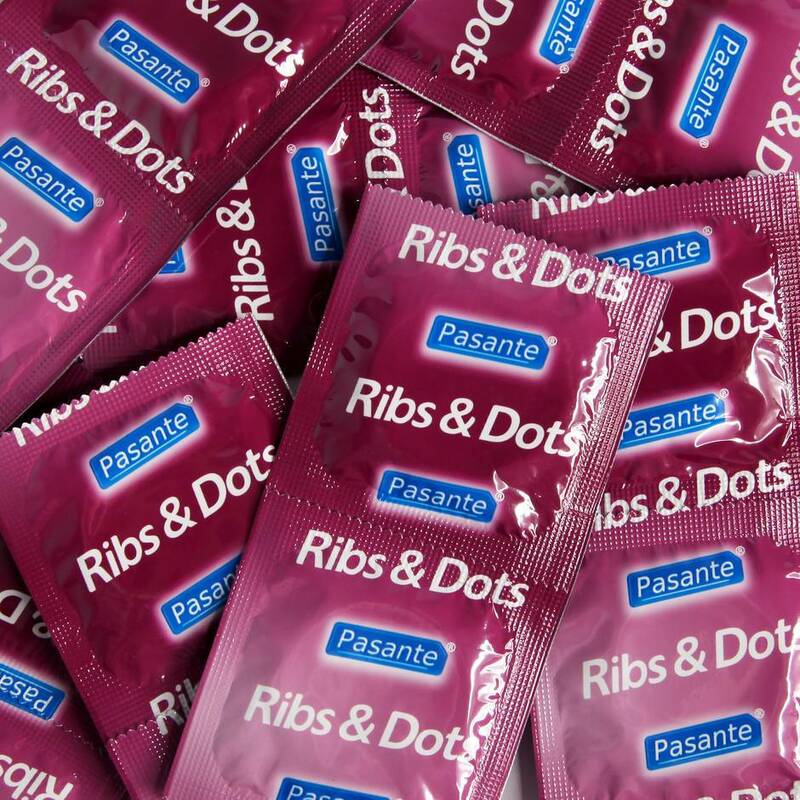 Invest in your pleasure with this huge bundle of 144 ribbed condoms from Pasante. Designed with two different textures to take your pleasure up a gear, these condoms have raised dots along the shaft with ribbing on the head for supreme stimulation. Order over the phone: Call 0044 1225 303 840 and quote code 51415. Make sure you stay protected from unwanted pregnancy and STIs with this extra large pack of condoms. Buying in bulk is a great way to stay safe without breaking the bank. The head each individually wrapped condom is lined with textured ribs and the length is covered with raised dots for incredible stimulation. Coated with a slick lube for extra pleasure. Me and my girlfriend were always spending loads of money on condoms until I saw these. When they came we couldn't wait to try one out. My girlfriend was very impressed with the feel of the ribs and dots and I was as happy as a guy can be wearing a condom can be! Overall, we both were very impressed with the price and feel we can not wait to try and get through them all. Having run out of condoms a few too many times me and my SO decided that a more permanent solution was needed - 144 should sort us out for a little while! Having tried many varieties of condoms from Durex, Pasante, Skins etc. these are by far the best value condoms we have tried. Being a great price- and being fantastic to put on and use! These condoms go on just as easily as any Durex condom with the perfect shape to perfectly slide on with no tugging or discomfort. They are also well lubed for a smooth experience. Furthermore, the ribs and dots really do make a difference for my SO, although she is rather sensitive to textures of any kind. The condoms are also not too thick, allowing me to feel the sensations very well for a "normal" thickness condom, also allowing me to feel safe that the condom won't rip. They are, however still thicker than an ultra-thin condom - so there will still be slightly less sensation. Overall, I would recommend these to anybody, being extremely good value when compared to more expensive brands such as Durex (especially in bulk). Great fit, texture, lube quantity and price. Could be thinner, but I don't mind due to the safety aspect. We can safely say, having worked our way through several packs of these (over 500 condoms), that they are a reliable bedroom staple and we have never had one break or slip off. I am about average length and slightly thicker than average girth. I ordered the regular Pasante multipack when these were out of stock and found them to be slightly uncomfortable, especially to remove. These, however, go on and off very easily, have a good amount of lubrication and are overall very comfy to wear. The ribs and dots didn't make a difference in sensation for my partner but do seem to make them easier to slip on and remove. Finally, of course, buying in bulk is a great way to save money if you're likely to get through this quantity, and without skimping on quality! They do the job, and do it well.